The Marsh Fritillary is threatened, not only in the UK but across Europe and is therefore, the object of much conservation effort. The wings of this beautiful butterfly are more brightly patterned than those of other fritillaries, with more heavily marked races being found in Scotland and Ireland. The larvae spin conspicuous webs that can easily be recorded in late summer. 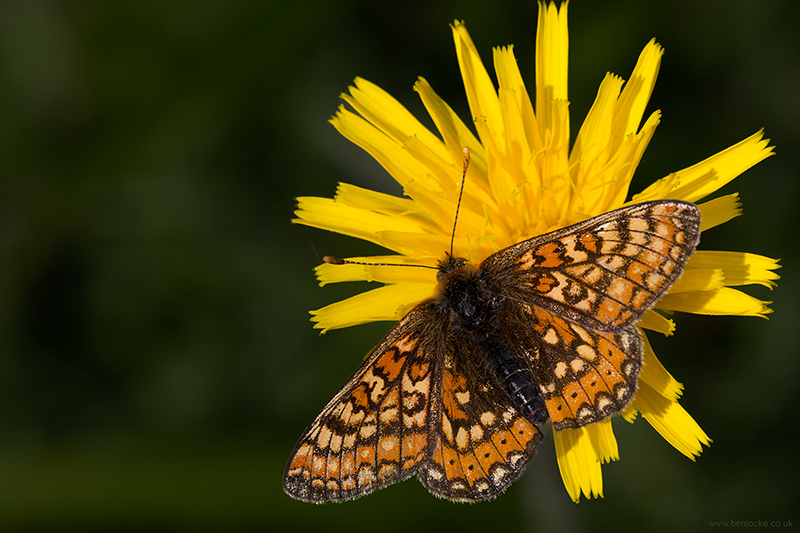 The Marsh Fritillary was once widespread in Britain and Ireland but has declined severely over the twentieth century, a decline mirrored throughout Europe. Its populations are highly volatile and the species probably requires extensive habitats or habitat networks for its long term survival. This individual was one of more than 600 recorded at Strawberry Banks in Gloucestershire that day, which I believe represents a British record.